As you may remember, a movie was made in 2012 by a southern California Copt that incited Muslims in the Middle East and threatened Muslim-Christian relations in an already volatile part of the world. In that unfortunate episode, there was a lot of rhetoric being thrown back and forth by both sides of the argument, and when the dust settled, a lot of dirty laundry was aired: conflicting theories about the true identity of Mohamed, underlying tensions between Christians and Muslims, and the like. 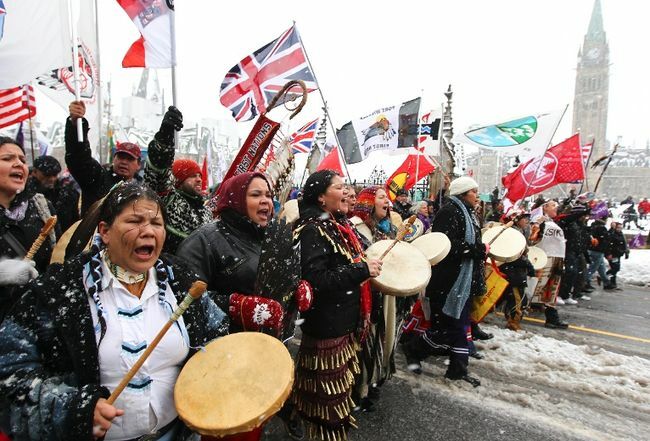 Only a few months later, Canada’s dirty laundry is being aired in the Idle No More movement. In a Canada-wide show of force, Aboriginal groups comprising of First Nations, Metis and Inuit have taken to the streets in protest to a number of measures recently taken by the Conservative government that violated long-standing Aboriginal property and treaty rights. In a more broad sense, the protests are also seen as a response to years of second-class treatment of Aboriginal groups by the government, dating back to early European settlement of North America by the British and French. It’s not the first time that we’ve seen a marginalized group lash back against oppression and inequality, nor will it be the last time. But, if I may, I’d like to offer some humble advice about how to turn the Idle No More movement into a defining moment in Aboriginal history, rather than let it sizzle into obscurity. The state of relations between the government and Aboriginal groups is, perhaps, in its worse state in years. Therefore, it’s understandable that there’s a lot of anger, frustration, and resentment on both sides, especially on the Aboriginal side. But one thing to note is that it is absolutely essential to gain the public’s opinion on this matter, because that’s what could ultimately bring change to the table. Mr. Harper might not be facing elections any time soon, but turning the tide of public opinion against him will certainly force him to seriously consider the demands and requests of the Idle No More movement. If the protests continue, they may force Harper to come to the negotiating table seeking a quick resolution, but it won’t turn the public tide against him, especially if these protests start to cripple the country’s transportation infrastructure and economy. Ultimately, this will end up affecting Canadians’ wallets and time, and whatever support Canadians had for the Idle No More movement might go out the window. To truly utilize the momentum of the Idle No More movement, there needs to be a balance between persistent, fervent protests and meaningful, educative dialogue. At the end of the day, you still stand to gain a supporter through actions as well as words. A number of my friends and relatives asked me “so what’s going on with this “Idle No More” stuff?” (not because I’m associated with the movement per se, but more because they know me as a political junkie), and to be perfectly honest, I wasn’t sure how to answer the question. It’s not necessarily that the protests lack an objective – I happen to think it’s a perfectly valid reason. But the problem is that the objective hasn’t been articulated in an eye-catching, provocative way. There is one way to gain that provocation – demand an objective that no one expects to be made. The example I like to think of to demonstrate this is the Egyptian Revolution. It started out with demands for Equality, Freedom, Democracy, etc. What really helped the revolution gain its momentum and capture the attention of local and global media was the persistent demands to remove Hosni Mubarak from power. It was unthinkable at the time because the man had been in power for almost 30 years, and wasn’t going to let go of power that quickly. In the end, persistence paid off and Mubarak stepped down under immense public pressure. I’m not saying that the Idle No More movement should demand that Harper step down, but there should be some provocative demand that will get people’s attention and force them to be aware of the issues and form an opinion on the matter. Canadians are smart people and like to inform themselves, but it’s difficult to be aware of something that you’re not exposed to. I can honestly say that I’ve never been too exposed to this topic before, but the Idle No More movement forced me to do my research and figure out where I stand on this. If this movement wants to catch the attention of more Canadians, they need to provoke the attention of curious Canadians and, at the very least, get them to educate themselves about the matter. There is a lot of emotion and frustration in the story of Aboriginals in Canada. However, it seems like a lot of people may not necessarily know or feel this emotional impact when they read the history of Aboriginals. Sure, we may be taught about the history of Aboriginals and how they played a role in the establishment of Canada, and who helped who during settlement, but to what extent do we know about the current living conditions that Aboriginals have had to live in? The full video can be seen here. I think it’s clear that the emotional impact is there. If this movement is going to succeed, it has to deliver that emotional impact to evoke sympathy from Canadians willing and able to help in any way that they can, and to start the healing process that’s clearly needed here. Next Kathleen Wynne’s Disasterous Email is Offensive to Non-Muslims and Muslims!